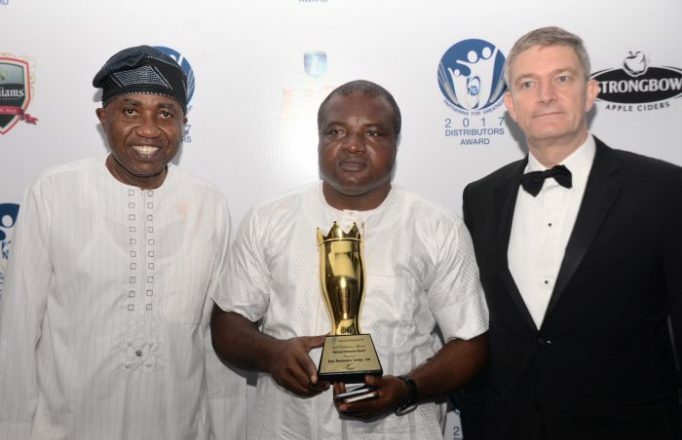 Nigerian Breweries Plc, held its 2017 Edition of Distributors and Trade Partners Award last Friday at the Eko Hotels and Suites, Victoria Island, Lagos. The award ceremony which is an annual event honours distributors and key transporters of the brewing company who excelled in the course of their business partnerships in the last year. Managing Director of Nigerian Breweries Plc, Mr. Nicolaas Vervelde, expressed gratitude to the distributors for the long lasting relationship and the value added to the business in 2016. Vervelde reiterated the company’s commitment and sustained support to its distributors and trade partners in the years ahead despite the continuing challenges in the economy. The MD revealed that as the company looks forward to 2017 and is prepared for the challenges, the years ahead will be more profitable, since the fundamentals of the Nigerian market is very positive. He commended the company’s trade partners for 70 years of support and promised sustained support for the partnership in the years ahead. Hubert Eze, Sales Director, Nigerian Breweries Plc, thanked the company’s trade partners for the undying support in the last year and explained that the annual award was created to be a celebration of their excellent performance in the previous year. He added that despite the numerous challenges in the operating environment, the company performed well in 2016 and recorded many milestones as a result of its partnership with them. Eze challenged the distributors and trade partners to keep the momentum as they set out to achieve their mutual business objectives in 2017. During the ceremony, the company gave out several awards to winners including the CFAO Award for Non-alcohol Distributors; Growth Award and Isuzu Direct Depletion to Road Award. Others were Regional Key Transporters Award; Brand Champions; National Key Transporter; Regional Champions and National Champions. The height of the event was the award for the National Champion and the company’s best distributor for 2016, which went to Ken Maduakor Group Limited from Nnewi in Onitsha Marketing Zone, who was the 2015 winner and beat two others for the 2016 coveted prize. The second prize went to Nathan Ofoma and Sons Limited, Nkpor, Anambra State, who beat Ifeoma Chukwuka Nigeria Limited, the winner in 2013 and 2014, to the third place. Maduakor who set an African record last year by selling more than five million cases of beer in 2015, broke his own record by selling more than six million cases in 2016. He expressed gratitude to the company for the gesture and advised that the momentum be sustained so that the company and its partners will remain on top. Maduakor was given a ten-pallet Isuzu Truck and a Trophy for emerging NB’s best distributor for 2016. Nathan Ofoma and Ifeoma Chukwuka each received a six-pallet Isuzu NMR and an award trophy. Ancaps Global Investment Limited from Kaduna won the National Key Transporters Award and received a plaque, an award trophy and a Mitsubishi L200 double cabin 4 x 4 DC van. Pauline Chimex who won the raffle draw for the night received a Mitsubishi L200 van.